You can now download all of the Back To Basics hype-free software development principles in a handy PDF for the e-readers and tree-murderers among you. It's a staggering 11,300 words - roughly 20% of your average technical book - written in just one weekend, so please forgive any silliness and imperfections. Hopefully you'll get the gist of it all the same. It's a bit off-topic, I know. And this isn't going to be everybody's copu of tea, but I've recently released an album of my music (well, actually, 2 albums) which you can download for free. If you're one of the twelve or so people in the world who like that sort of thing, then you can follow @apeswithhobbies on Twitter or give us the nod on Facebook. You can also hear and download tracks from a bonus album of electronica called Synthopathic from the Apes With Hobbies last.fm page - which may come as good news for non-metal fans. So, obviously, parlezuml.com is back online. After 2 days of outage, support have chalked it up to "one of those things". Which is good to know. 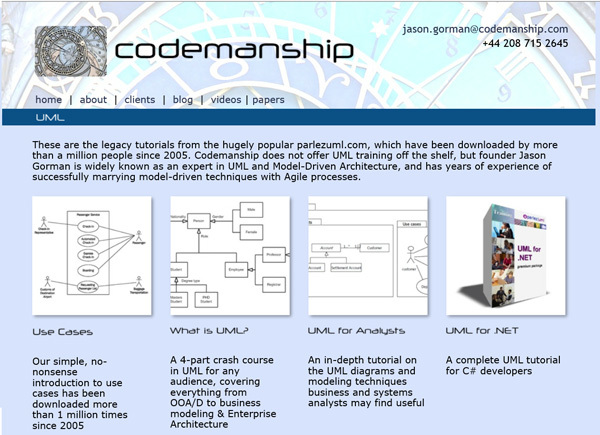 If you've tried to visit codemanship.com or to email me via that address, apologies. The domain has been unavailable for the last couple of days and I'm in the process of getting to the bottom of that. The Early bird offer (all 3 courses for the price of 2) ends on Saturday at midnight, so if you want to take advantage of that great special offer we'll need your booking confirmed this week. 2010 brings a winter wonderland to much of Europe, and the first good auditions for Software Craftsmanship 2010 have been carried in on those freezing cold arctic winds. David Laing has sent me a link to an already pretty slick-looking session on TDD for databases, which touches on lots of great stuff and utilises a good range of test and build expertise which I personally need to get my head around. Emmanuel Gaillot has submitted a very interesting demonstration of the Robozzle kata in Haskell (not, I suspect, the last Haskell audition we'll see). A very good audition which I'm confident will translate into a great session. Robozzle Kata in Haskell from Emmanuel Gaillot on Vimeo. At this stage, formal auditions have not begun, except for coaches, but I very strongly recommend sticking your videos up and getting early informal feedback, as David and Emmanuel have demonstrated brilliantly here. The SC2010 community site should be up and running in early February, and you will be able to join, submit links to your audition videos and vote on the other auditions posted and give feedback. Auditions will run through February to May, and you will be able to rehearse and refine and resubmit your auditions as many times as you like during that period before the final votes are counted and selections are made for the conference. If you're interested in coaching a handful of auditionees each month to help them improve their sessions (and can spare 5-10 hrs/month), then I still have room for 2-3 more of you lovely, generous folk to lend a hand. In the spirit of egalitarianism, everybody must audition, including coaches. You don't need to be a master software craftsman, just confident that you know sh*t from shinola when it comes to practices like TDD and refactoring. Coach auditions need to be with me before February. 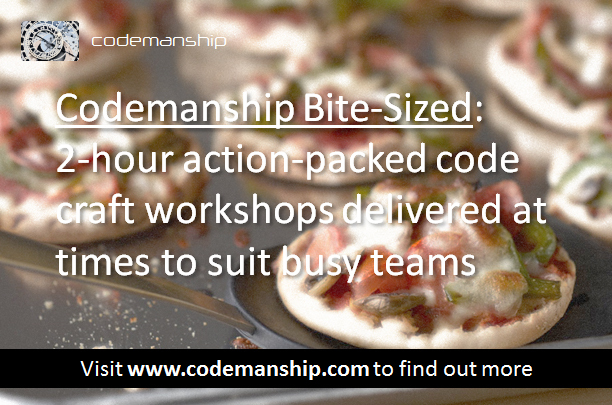 20 minutes of basic TDD or a bit of refactoring would easily suffice. Email links to auditions here. Coaches will get major kudos and a goody bag, and I doubt it'll look to shabby on your CV that you were an official coach at Software Craftsmanship 2010. "To care. To learn. To practice. To share."